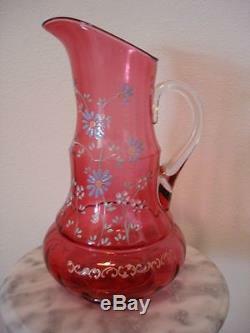 Here's a great Northwood Ruby or Cranberry Art Glass Tankard Lemonade Pitcher. It stands 12 1/2 tall and made c. At 109 years old it's a true Antique. This Lemonade pitcher is one of the prettiest I've seen. The enamel floral design is in very good condition. No chips or cracks and no heat checks of any kind to the handle. No stains or mineral deposit. Any unusual white or dark spots shown in the photos are from camera glare. Ware on the bottom is commensurate to it's age. The photos don't do justice for this one. This will make a great functional accessory to any Victorian home. The item "Northwood Tankard Cranberry art glass Lemonade Pitcher Enamel Floral Decoration" is in sale since Saturday, April 11, 2015. This item is in the category "Pottery & Glass\Glass\Art Glass\North American\Other North American Art Glass". The seller is "ainventor" and is located in Gibsonton, Florida. This item can be shipped worldwide.